I stopped using Facebook. There are many reasons for that, using tax hole to avoid taxes, privacy concerns and others. But I have to admit Facebook was really easy to keep in touch with my friends. All my friends are in there and once you are not on facebook, you stop hearing from them. I was since exploring open source alternatives to replace Facebook. But there isn’t any good alternatives yet and all of them requires a complex setup (this is if you want to host it to keep all data to yourself, there are open source social networks hosted by others and they are quite easy to join). I believe if we want to get rid of all those big companies profiting from selling our data, we need a simple setup that can handled by anyone. So I was thinking of something that has following features. First, it would be easy to setup. Ideally people can just start it on their laptop or desktop (and if possible on mobile phone). They can probably run a binary or executable and it will start the instance. Second, everyone will have their own instances. so when I add a friend, it will actually add a link to other instance from my one and whenever the other instance posts something (for me or to everyone) it will then grab it and queue it in my message/notification list. third, we need a way to deliver the messages when the receiver is turned off. I think this is a big challange as if I’m sending a message to my friend and my friend’s instance is turned off, then the message needs to be somewhere that will try sending that message again (like mailservers). Each of these issues have challenges that needs resolving. For the first issue, we need a system similar to DNS system that can search and find those instances. Second issue is already handled by systems like matrix and similar implementations. Third issue needs more thinking as we need the messages to be stored somewhere when the sender or receiver goes offline. P2P could be a possibility, or we can check how Dovecot future implementation (https://www.theregister.co.uk/2017/10/12/openxchange_imap_chat_killer_app/) might work with this. 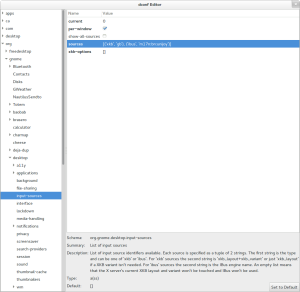 Using unijoy on Ubuntu 17.04 is similar to what it was before. First thing is Ibus and m17n engine needs to be installed on your system before this could be done. 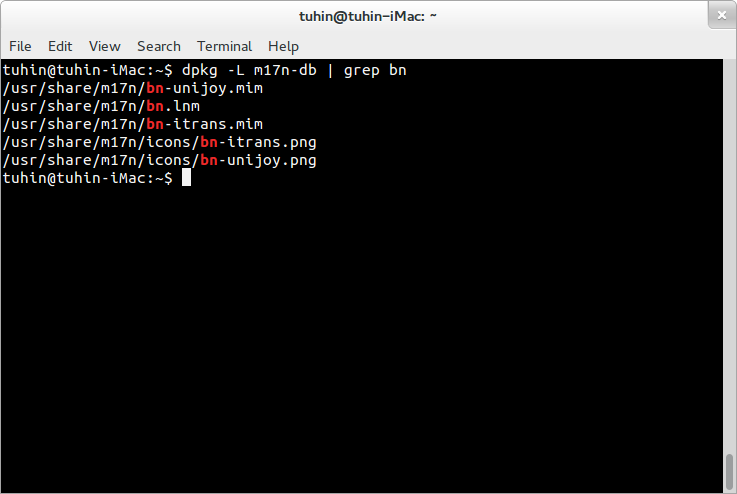 If you only want unijoy, then you don’t need to add m17n-contrib in your command. 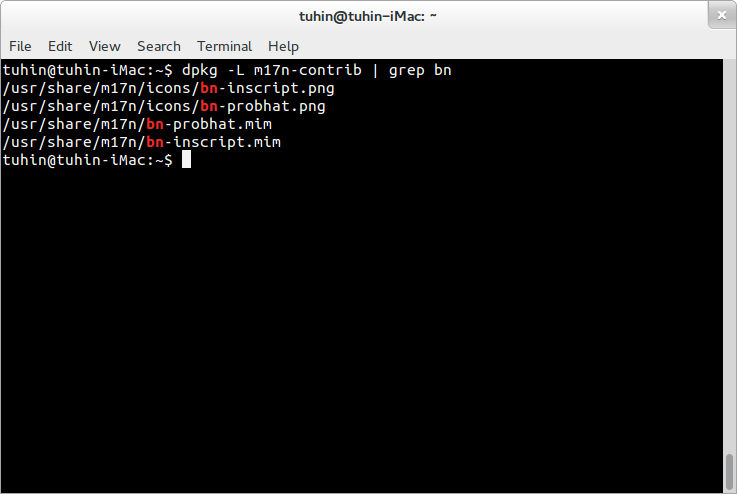 this will install ibus on your system with m17n engine (this engine has Bangla/Bengali and other East Asian Language writing system). You can also use Ubuntu’s software centre to install Ibus. 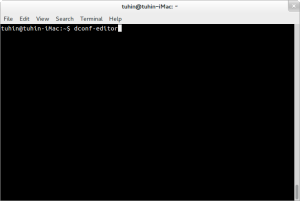 Now type the following in your terminal. This will list all the Bangla/Bengali keyboard layout installed on your system. 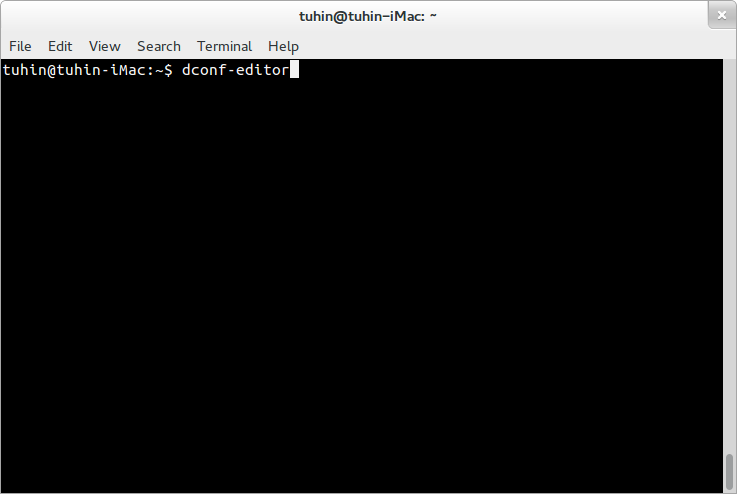 Type dconf-editor in your terminal and the editor will run. Now you can make changes in there. You have to change following settings to get Unijoy layout added as your keyboard layout. 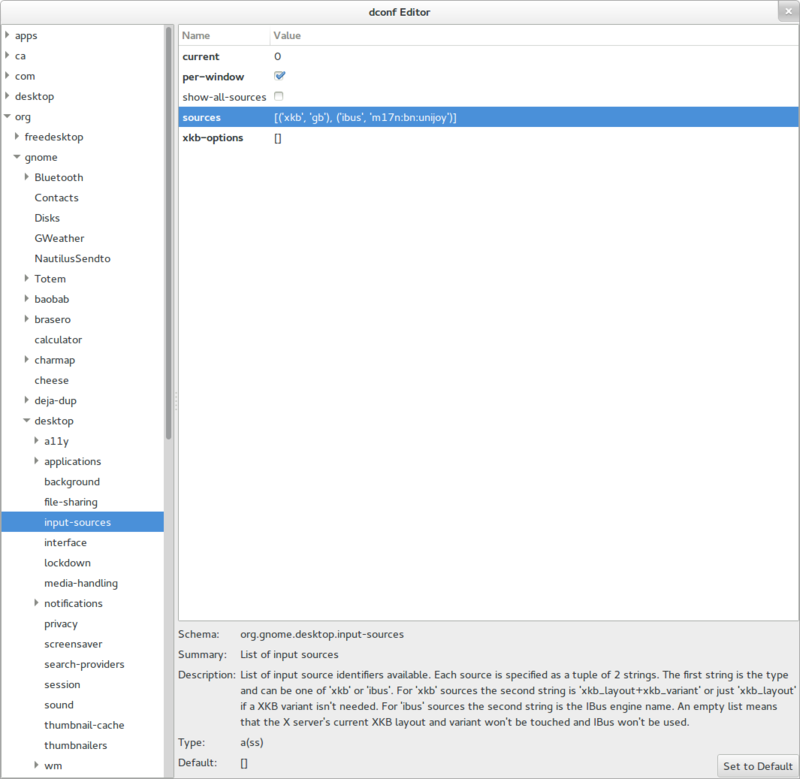 org.gnome.desktop.input-sources and update the value of sources from there. 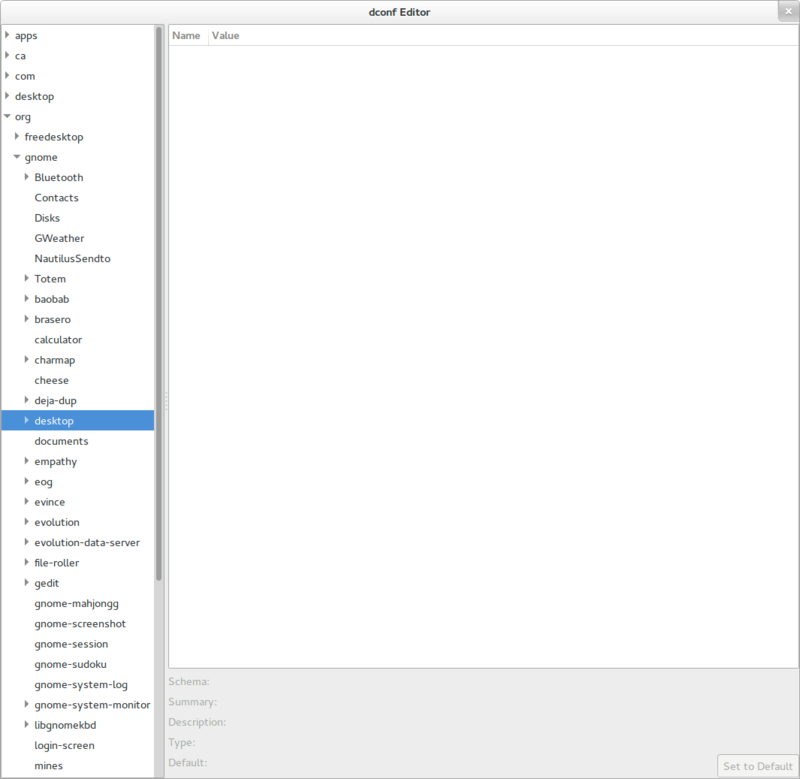 In order to do it, click to expand org, then find and click on gnome from there. After that expand desktop and then click on input-sources. (‘ibus’, ‘m17n:bn:unijoy’). For other keyboard settings, change bn:unijoy with something else. For example, if you want inscript layout, changed the second settings to something like this (‘ibus’, ‘m17n:bn:probhat’). That’s it. 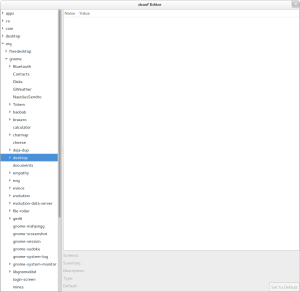 Now you’ll be able to see unijoy layout, or other layout along with the default keyboard layout. 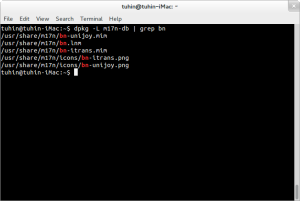 [Update: You need to restart ibus in order to start using the unijoy layout. 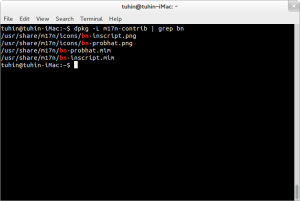 To restart ‘ibus’ type ibus restart in terminal and press enter.]. 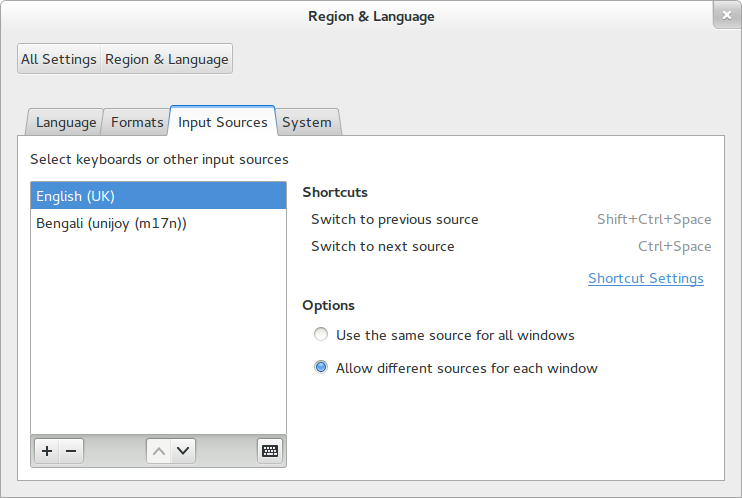 Please note that, before ubuntu 15, the default keyboard shortcut for changing input method was ctrl+space, but in ubuntu 15, the shortcut is super+space. 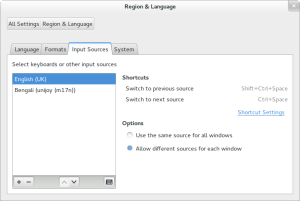 If you want to change keyboard shortcut to switch between keyboard layouts, then go to Settings>Region & Language Settings and then goto input sources tab and on the right hand side, you’ll see shortcut settings. You can choose which keys to press to switch between keyboard layouts. Assamese language has the same alphabets like Bangla, but if you however don’t want to use Assamese fonts, then just skip that package name (fonts-lohit-beng-assamese). Updating my ubuntu to 13.10 just removed my input method settings and as a result I was unable to write in Bangla (Bengali) using unijoy layout anymore. I spent quite a long time trying to find a fix for it and writing it down here so that I can remember the steps if needed again. First thing is Ibus and m17n engine needs to be installed on your system before this could be done. There is a good tutorial on how to do that in Joydeep Bakshi’s website (update: as of Aug 14, 2014, it seems this website is down). However we do not need all the steps mentioned in there, so I’ll write down what to do step by step.